Riverside Memorial Park was established in 1910 in the Campostella Heights area of Norfolk. The City of Norfolk purchased it in 1971. Riverside covers more than 44 acres and has a unique design - like the spokes of a wheel extending outward from a central circle creating sections shaped like pie slices. Since 1995, over 200 trees have been planted at Riverside as part of an ongoing urban forestry program. The installation of various species of trees enhanced Riverside's park-like atmosphere and those interested in horticulture find it very educational. Tugboats, industrial cranes, and other seafaring structures provide the backdrop to several sections at Riverside Memorial Park reminding those who visit of the importance of the ship repair industry to the City of Norfolk. The Langley Angel monument is the largest at Riverside, dating back to the time when the Hendricks family owned and operated both the cemetery and a monument company on site. Additional, larger monuments populate the older sections of the park. Search for an interment at Riverside. 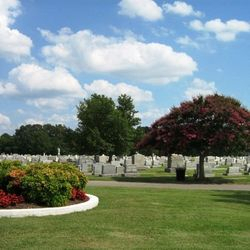 Access a listing of Riverside interments. Learn about Norfolk Notables at Riverside. The main circle at Riverside was once home to a bell tower. The bell would chime and was heard throughout the neighborhood. The U.S. Army used the bell tower as a lookout during World War II and a U.S. Army camp was maintained in the back of the cemetery. 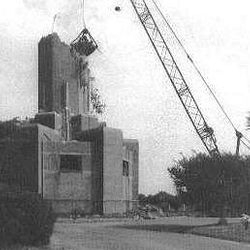 Unfortunately, the bell tower fell into disrepair and was demolished in the 1970s. The story of the bell tower reminds us of the importance of conserving the past for the education and enjoyment of future generations. How interesting and historic it would be to have the bell tower standing at Riverside Memorial Park today - to listen to its chimes in remembrance of those who have passed, to teach our children of its significance, to stand in the belfry and appreciate the view that those soldiers had so many years ago.